During the iconic years of the pulp era – the Roaring Twenties and the Thrilling Thirties – action stories featured hard-boiled detectives and beautiful dames, investigators of the supernatural, masked vigilantes, and cliffhanging adventurers. No matter their opponent, setting, or genre, they all carried heaters, rods, or gats. 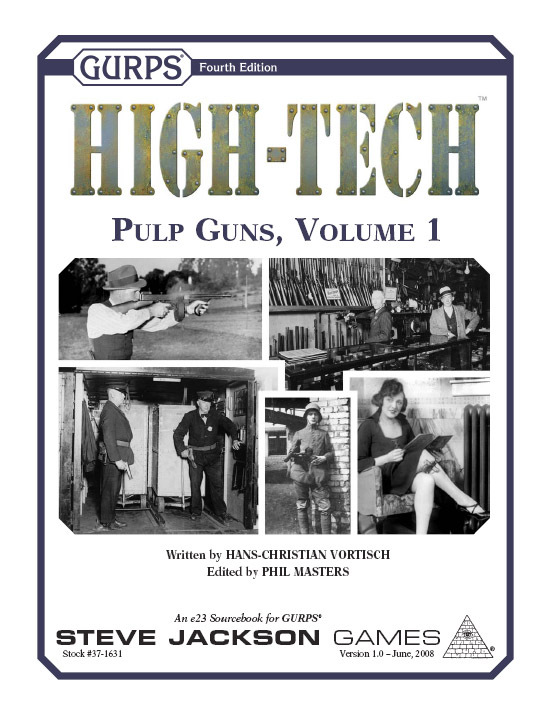 High-Tech: Pulp Guns, Volume 1 catalogs the handguns, shotguns, and submachine guns common to the two-fisted heroes and fiendish villains of the day. 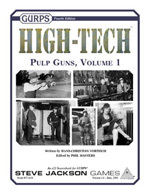 Outfit gangsters and G-men, big-game hunters and brutal henchmen with pistols, shotguns, and even the infamous "Tommy Gun." Arm your adventurers for Cliffhangers campaigns, Horror games, or even Prohibition-era Supers and Mysteries!